A box from Freshly Picked moccs! I could hardly contain myself as I practically ran back up the stairwell and into our kitchen to get something to cut open the box. I lifted the top flaps, turned the box over and into my hands slipped a bag, a freshly picked bag... with the softest and most perfect little pair of baby moccs you ever did feel... and looks wise? They are beautiful! A work of art! Needless to say I was so excited I hardly got anything done for next two hours as I waited for my nine and a half month old daughter Bella to wake up from her nap so I could try them on her (and yes I almost woke her up to try them on her several times, but thankfully my better judgment got the best of me and I didn't lol). We chose size 3 moccs in Gold and we couldn't be happier: with a size 3 they fit her good, not too big, not too small, a little room grow, I can already see that we will most definitely get a lot of wear out of them and they will go perfectly with the outfit I am working on putting together for her 1st birthday party coming up here in a couple months! Freshly Picked moccs are made of the highest quality leather (100% Genuine Leather) and I think the thing that surprised me about them most was how soft they are! I don't know why, but I thought they would be somewhat stiff and require a "breaking in" period, but nope, no "breaking in" required, they are extremely comfortable and cozy on my daughter's feet and she loves wearing them! They're also lighter than I thought they'd be, they're light as a feather! 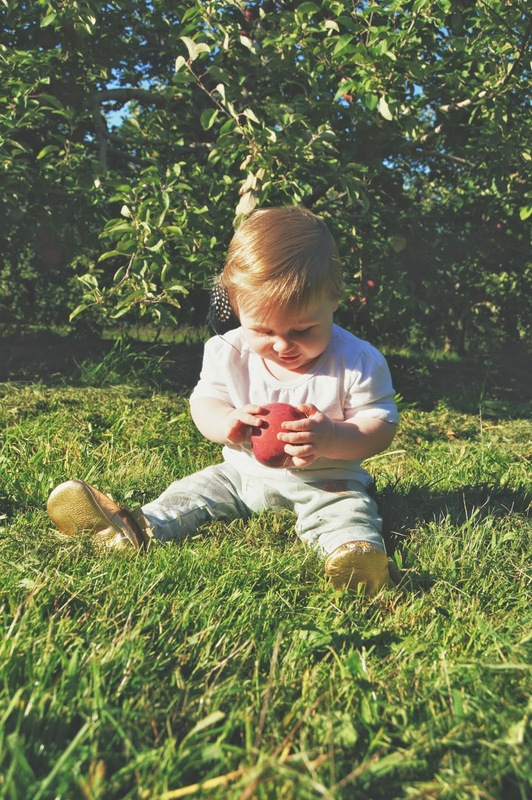 Which is wonderful for small feet that are crawling and in the beginning stages of learning to walk. Freshly Picked Moccs also don't come as a "left" moccasin and "right" moccasin, they come straight and as your child wears them they shape uniquely to their little tootsies! Bella has already started to shape hers after only wearing them a handful of times! I've also heard that in time their little foot will be imprinted on the bottom of the moccasin, forever sealing the memories of everywhere your child journeyed and wandered... that is one thing I am looking forward to and after she is done wearing them they will become a keepsake I will never part with. As for the price, yes, they are a little pricey, but after holding a pair in my hands, seeing them on my daughter and feeling the quality, I think they are worth every bit of the $60 price tag they sell for! Maybe they're not something you could afford everyday, but at least for a special occasion would definitely be worth it, plus like I said, I can tell they're going to last a very long time! I also love the elastic on the ankle of the shoe, they actually stay on! 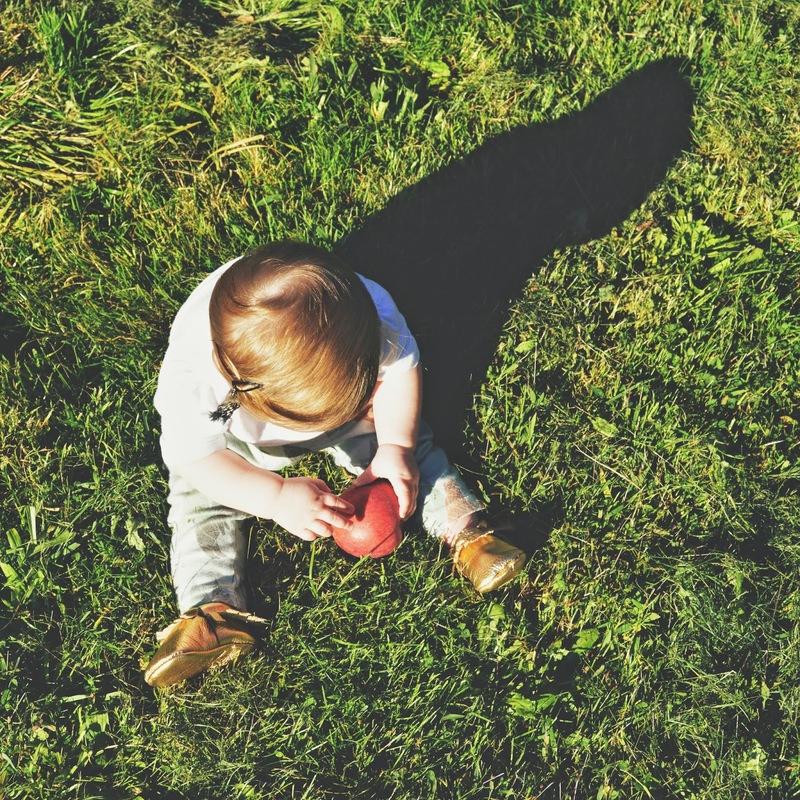 Unlike most regular baby shoes that babies kick or pull off in a matter of minutes (sometimes seconds). Upon closing my review of Freshly Picked Moccs I have only good things to say about them to anyone who might ask, from the wonderful people they have working for them to the quality and beauty of the moccs (their shininess gets me every time lol), to the fact that they were kind enough to give me this pair for Bella to review and last but not least they are giving one of you the chance to win your very own pair of Freshly Picked Moccs for your little one! If you win, you can choose any size and any color/style you want! I know, Amazing right?! The giveaway will run from Wednesday, October 1st to Tuesday, October 7th at midnight EST. A random winner will be chosen via rafflecopter and announced on October 8th. Just follow the steps in the rafflecopter below to enter (end of this post)! Good Luck! a Rafflecopter giveaway Please note: I received a free product to review, but the opinions expressed above are 100% my own. Bella is so precious!!!! The pictures are adorable. 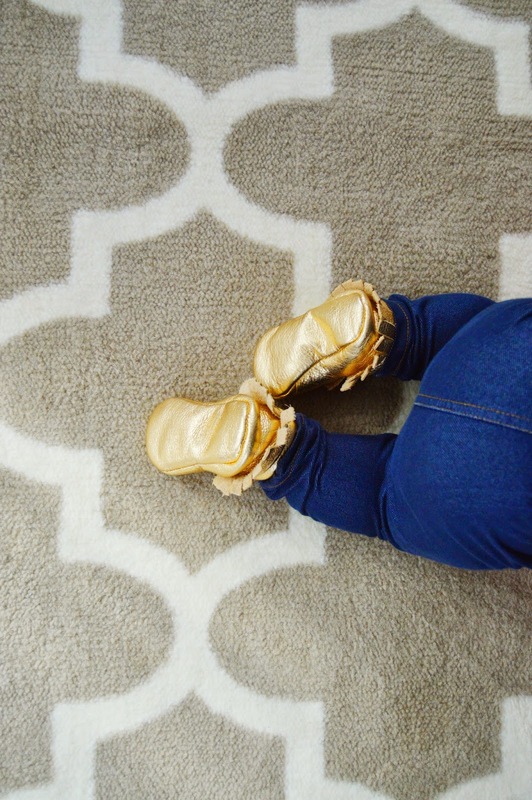 I am so happy you got to try these amazing moccs! Thank you for sharing! such a good review! I am gushing over the new styles for fall and the weathered brown! These are so cute! I love the gold color! I agree, best mocs, EVER! Worth every penny! We had one pair for our little but they no longer fit and I've been itching to replace them! Or maybe get a pair for the babe in my belly...!? I've also loved the camo ones for my little man! My favorite probably have to be the ants print! So cute! But I also love the weathered brown. Hard to choose a favorite! 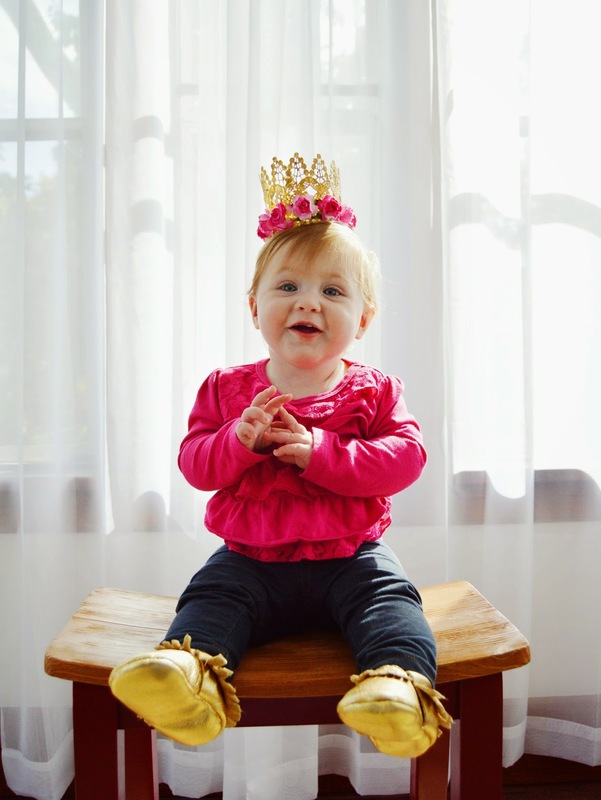 If I had a little girl I'd get the gold ones also, they look adorable on your little one. I really want the rose gold or blush colored mocs. Those are The best ones for my little girl's pink wardrobe! I'm not a fan of the new gator skin moccs. I want butterscotch! I am gushing over the denim on denim! Dying over all of them! I would LOVE a pair in Birch! So versatile and will go with everything! I would love the weathered brown! The metallics!! OMG! I can't narrow it down to just one. They are so adorable and perfect for this time of year! Blush for my baby girl!! I love all the styles of freshly picked moccs they are just so rad!! OM(sweet)Goodness... 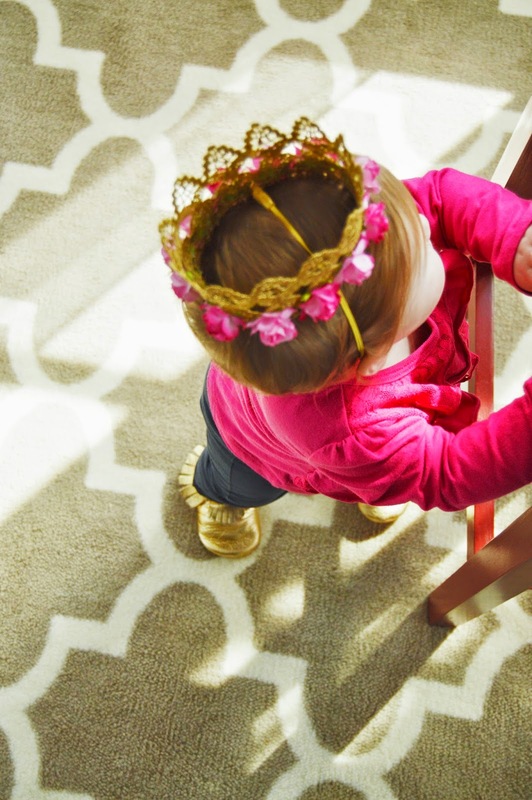 I don't know which I adore more the most perfect little shoes ever or your little doll in that crown! 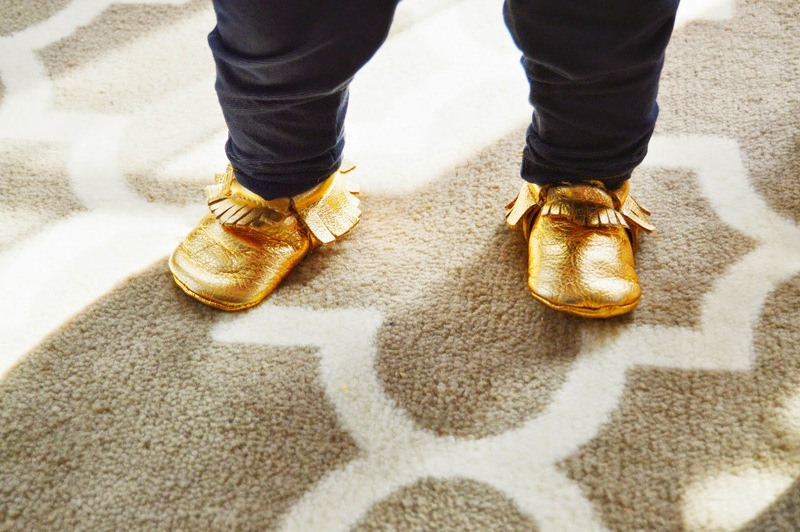 Ohhh I would LOVE to have a pair of the gold ones for my little luv bug on the way. Thank you so much for the sweet chance!! Crossing my fingers! Such beautiful moccs!! Love love love me some freshly picked mocs! Frosted rose are too cute. Swimming with the Sharks Gray! 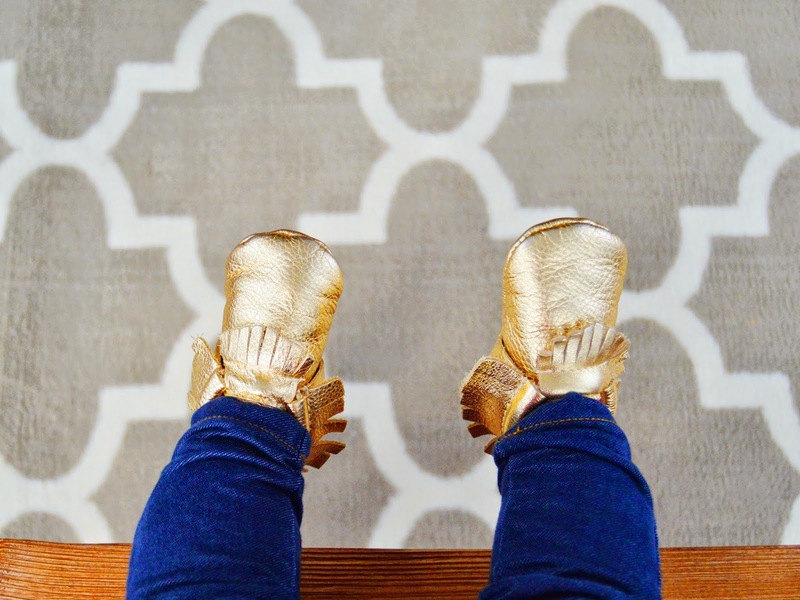 I recently bought the gold of FP moccs for my baby for her first bday and I agree 100% with everything you said here! I am totally obsessed with the butterscotch!! Such a cutie pie she is! I am so happy you got to try these! I have been so hesitant to purchase but I am absolutely in love with them. My favorites are the Heirloom Limited Edition and the Merci Limited Edition ones. OMGGGGosh... these/your little luv bug are beyond adorbs!!! I would literally LOVE to have any pair but especially adore the heirloom polka dot moccs & the pineapple ones just make me happy! I would love these in blush for my little girl! Yay!!! All entered !! 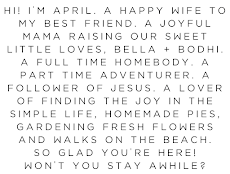 Can't wait !! I am trying to get my hands on a pair of Aruba for our holiday photos! They're limited addition of course and already gone! I may have to settle for another color! These are so cute! I'd love either weathered brown or camo for my little man! I love those gold mocks!!!!! love the steel and blush!!! I can't get enough of the neon pink and grape suede!! Thank you for the chance to win these precious shoes! 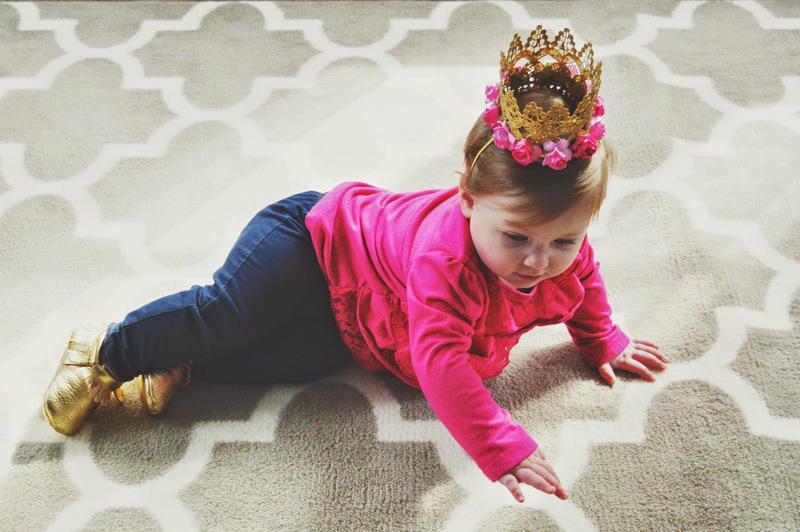 I love your blog & your little one is a doll! !